At the end of the day do you feel completely sapped and drained of energy, and yet can’t point to anything you accomplished of real significance? Then you, my friend, are probably confusing the urgent with the important. 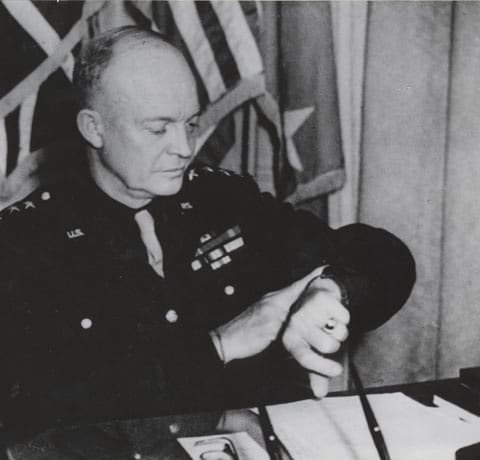 Below we look into the distinction ol’ Ike made between those two very different things, and explore how understanding the “Eisenhower Decision Principle” can help you become the man you want to be. Urgent means that a task requires immediate attention. These are the to-do’s that shout “Now!” Urgent tasks put us in a reactive mode, one marked by a defensive, negative, hurried, and narrowly-focused mindset. Important tasks are things that contribute to our long-term mission, values, and goals. Sometimes important tasks are also urgent, but typically they’re not. When we focus on important activities we operate in a responsive mode, which helps us remain calm, rational, and open to new opportunities. It’s a pretty intuitive distinction, yet most of us frequently fall into the trap of believing that all urgent activities are also important. This propensity likely has roots in our evolutionary history; our ancestors concentrated more on short-term concerns than long-term strategy, as tending to immediate stimuli (like a charging saber-toothed cat) could mean the difference between life and death. Modern technologies (24-hour news, Twitter, Facebook, text messaging) that constantly bombard us with information have only heightened this deeply engrained mindset. Our stimulus-producing tech treats all information as equally urgent and pressing. Miley Cyrus’ Twerk-gate is given the same weight as important D.C. policy discussions. We are, as author Douglas Rushkoff claims, experiencing “present shock” – a condition in which “we live in a continuous, always-on ‘now’” and lose our sense of long-term narrative and direction. In such a state, it is easy to lose sight of the distinction between the truly important and the merely urgent. The consequences of this priority-blindness are both personal and societal. In our own lives, we suffer from burnout and stagnation, and on a broader level our culture is unable to solve the truly important problems of our time. Below we go into detail about each quadrant and explain which one we should spend most of our time in if we wish to be our best and make the most of our lives. Quadrant 1 tasks are both urgent and important. They’re tasks that require our immediate attention and also work towards fulfilling our long-term goals and missions in life. Quadrant 1 tasks typically consist of crises, problems, or deadlines. With a bit of planning and organization, many Q1 tasks can be made more efficient or even eliminated outright. For example, instead of waiting until the last minute to work on a term paper (thus turning it into an urgent task), you could schedule your time so that you’re done with your paper a week in advance. Or instead of waiting for something in your house to fall apart and need fixing, you can follow a schedule of regular maintenance. While we’ll never be able to completely eliminate urgent and important tasks, we can significantly reduce them with a bit of proactivity and by spending more time in Quadrant 2. Quadrant 2 tasks are the activities that don’t have a pressing deadline, but nonetheless help you achieve your important personal, school, and work goals as well as help you fulfill your overall mission as a man. Q2 tasks are typically centered around strengthening relationships, planning for the future, and improving yourself. You don’t know what’s truly important to you. If you don’t have any idea what values and goals matter most to you, you obviously won’t know what things you should be spending your time on to reach those aims! Instead, you’ll latch on to whatever stimuli and to-dos are most urgent. 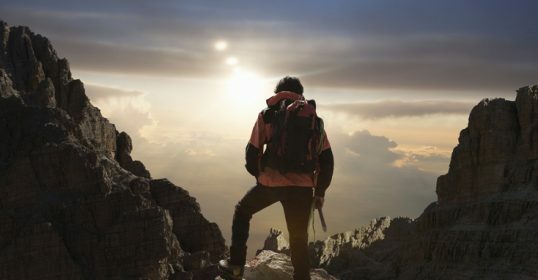 If you feel like you’re lacking a life’s mission or aren’t sure what your core values are, I highly recommend reading our articles on developing a life plan as well as defining your core values. Present bias. As just discussed, we all have an inclination to focus on whatever is most pressing at the moment. Doing so is our default mode. It’s hard to get motivated to do something when there isn’t a deadline looming over our head. Departing from this fallback position takes willpower and self-discipline – qualities that don’t come naturally and must be actively cultivated and expressed. Because Q2 activities aren’t pressing for our attention, we typically keep them forever on the backburner of our lives and tell ourselves, “I’ll get to those things ‘someday’ after I’ve taken care of this urgent stuff.” We even put off figuring out what’s most important in life, which of course only perpetuates a cycle where all we ever take care of are the most urgent to-dos on our list. But “someday” will never come; if you’re waiting to do the important stuff until your schedule clears up a little, trust me when I say that it won’t. You’ll always feel about as busy as you are now, and if anything, life just gets busier as you get older (at least until you retire). Quadrant 3 tasks are activities that require our attention now (urgent), but don’t help us achieve our goals or fulfill our mission (not important). Most Q3 tasks are interruptions from other people and often involve helping them meet their own goals and fulfill their own priorities. According to Covey, many people spend most of their time on Q3 tasks, all the while thinking they’re working in Q1. Because Q3 tasks do help others out, they definitely feel important. Plus they’re also usually tangible tasks, the completion of which gives you that sense of satisfaction that comes from checking something off your list. But while Q3 tasks may be important to others, they’re not important to you. They’re not necessarily bad, but they need to be balanced with your Q2 activities. Otherwise, you’ll end up feeling like you’re getting a lot done from day-to-day, while eventually realizing that you’re not actually making any progress in your own long-term goals. That’s a recipe for personal frustration and resentment towards other people. 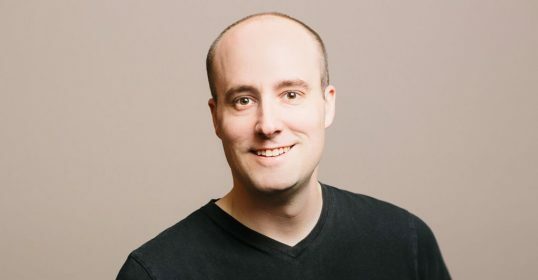 Men who spend most of their time working on Urgent but Not Important Tasks often suffer from “Nice Guy Syndrome,” and want to constantly please others at the expense of their own happiness. If that’s you, the solution is simple: Become more assertive and start to firmly (but politely) say no to most requests. 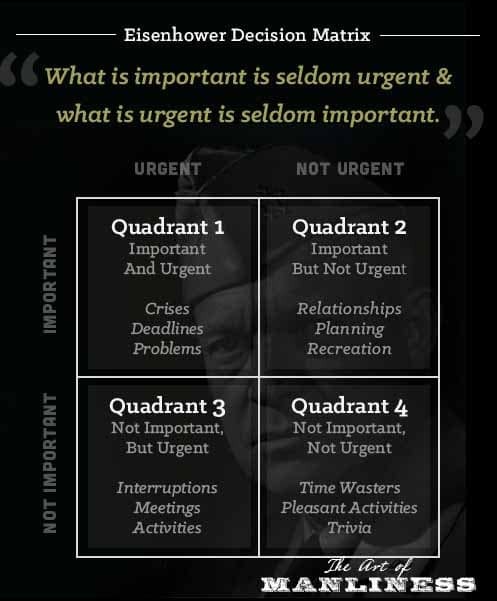 Quadrant 4 activities aren’t urgent and aren’t important. They’re what I like to call “dicking around” activities. Q4 activities aren’t pressing nor do they help you achieve long-term goals or fulfill your mission as a man. They’re primarily distractions. I think if most of us did a time audit on ourselves, we’d find that we spend an inordinate amount of time on Q4 activities. I’m sure most of us have those “I’m wasting my life” moments after we’ve spent hours surfing the web and realize we could have used that time to pursue our more ennobling life goals. No? That’s just me? Dang. As a pragmatist, I don’t think you need to eliminate Q4 activities altogether from your life. After a particularly hectic and busy day, randomly browsing the internet or watching a favorite TV show for a half hour is exactly what my brain needs to decompress. Instead of aiming to completely rid yourself of Not Urgent and Not Important tasks, try to only spend a very limited amount of time on them. 5% or less of your waking hours is a good goal. In our present shock world, the ability to filter the signal from the noise, or distinguish between what’s urgent and what’s truly important, is an essential skill to have. I promise as you spend most of your time working on Not Urgent but Important tasks, you’ll feel a renewed sense of calm, control, and composure in your life. You’ll feel like you’re making real progress. By investing your time in Q2’s planning/organizing activities, you can prevent and eliminate many of the crises and problems of Q1, balance the requests of Q3 with your own needs, and truly enjoy the veg-outs of Q4, knowing that you’ve earned the rest. By making Q2 tasks your top priority, no matter the emergency, annoyance, or deadline you’re hit with, you’ll have the mental, emotional, and physical wherewithal to respond positively, rather than react defensively. To help you apply the Eisenhower Decision Matrix, we suggest checking out the following tools. Eisenhower App. This is an iPhone app that allows you to easily organize your task according to the Eisenhower Decision Matrix. I had a chance to play around with it a bit and liked what I saw. Haven’t been able to find anything similar for Android. Download the Eisenhower Decision Matrix Worksheet. I created a snazzy little PDF of the Eisenhower Decision Matrix available to download for free. Print one out tonight and set aside 30 minutes for personal reflection. Make a list of the tasks you spend most of your time on and assign them to an appropriate quadrant in the matrix. Doing so will give you a rough idea of whether you’re spending time on activities that are actually important. After you do that, think of ways you can reduce the amount of time you spend on Q1, Q3, and Q4 tasks and increase the amount of time you spend on Q2 activities.